U.S. President Donald Trump and first lady Melania Trump disembark from Air Force One upon arrival at Ezeiza International Airport in Buenos Aires, Argentina, Nov. 29, 2018, as they travel to attend the G20 summit. U.S. President Donald Trump begins two days of meetings with world leaders Friday in the Argentinian capital, which is hosting the G-20 summit of the world’s leading economies. But one counterpart he will apparently not be sitting down with is Russian President Vladimir Putin. Trump had been scheduled to hold a two hour meeting here with Putin despite intense criticism in the United States and among NATO allies following Moscow’s seizure Sunday of the three Ukrainian vessels and their crews in the Kerch Strait as they tried to make their way to the Ukrainian port of Mariupol, in the Sea of Azov. White House Press Secretary Sarah Sanders told reporters on Air Force One that the decision to cancel the meeting was “made on the plane” after Trump received an in-flight briefing by Secretary of State Mike Pompeo, National Security Adviser John Bolton and White House Chief of Staff John Kelly about the tensions between Russia and Ukraine. President Donald Trump talks with reporters before traveling to the G-20 Summit in Buenos Aires, on the South Lawn of the White House, Nov. 29, 2018, in Washington. Just two hours earlier as he departed the White House, Trump had told reporters he looked forward to meeting with Putin during the G-20 leaders’ meeting. “I think it’s a very good time to have the meeting,” Trump had told reporters on the South Lawn. The reversal came on the same day as the president’s former personal lawyer, Michael Cohen, pleaded guilty to lying to Congress about a proposed Trump skyscraper in Moscow. Russian officials are expressing surprise about Trump’s cancellation of the meeting with Putin, with whom the U.S. president has enjoyed a warm relationship despite significant geo-political differences between the two countries. “A cancellation means that the discussion on key international issues is being postponed indefinitely,” Kremlin spokesman Dmitry Peskov told the RIA news agency. 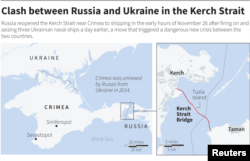 Ukrainian naval ships, which were recently seized by Russia's FSB security service, are seen anchored in a port in Kerch, Crimea Nov. 28, 2018. Meanwhile, Ukrainian President Petro Poroshenko asked NATO countries to send naval ships to the Sea of Azov to aid his country and “provide security” amid tensions with Russia. Ukraine, once a Soviet satellite state, is not a NATO member. Poroshenko’s comments were published Thursday in the German newspaper Bild. She said NATO ships routinely patrol the area and several NATO allies conduct reconnaissance flights over the region. “We will continue to assess our presence in the region,” Lungescu added. Erdogan has held phone talks with leaders on both sides, and said he would continue discussing the issue with Putin and Trump at a G-20 summit. Poroshenko wrote on Twitter Thursday that his country will impose unspecified restrictions on Russian citizens in response to Russia’s actions. Ukraine has already denied Russians entry into the country since last week’s incident. VOA's Chris Hannas and Wayne Lee contributed to this report.